To the rest of the world they were fools. Rebels. Ignorant peasants. People who shunned wealth and power and welcomed the poor and uneducated. These first followers were persecuted and their leaders killed, yet this ragged collection of lowly tradesmen, women, and slaves created a movement that changed the world. How did this happen? How did the kingdom of fools conquer the mighty empire that was Rome? In this fascinating new biography of the early church, Nick Page sets the biblical accounts alongside the latest historical and archaeological research, exploring how the early Christians lived and worshipped – and just why the Romans found this new branch of the Jewish faith so difficult to comprehend. 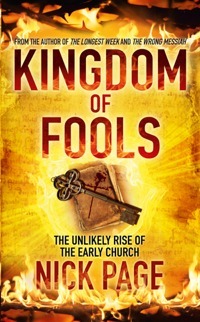 KINGDOM OF FOOLS is a fresh, challenging, accessible portrait of a movement so radical, so dangerous, so thrillingly different that it outlasted the empire that tried to destroy it and went on to become the driving force of our cultural development – and claims more followers today than ever before in history. I wish that it were possible to meet with one who could deliver to us the history of the Apostles, not only all they wrote and spoke of, but of the rest of their conversation, even what they ate, and when they ate, when they walked, and where they sat, what they did every day, in what parts they were, into what house they entered, and where they lodged – to relate everything with minute exactness, so replete with advantage is all that was done by them. Thanks John. Appreciate it. Maybe catch up for a beer sometime. All right, that actually comes from a commentary he wrote on Philemon in around 400 AD but it more or less sums up what I was trying to do in the book – to paint a picture of the early church: who they were, why they joined, what their life was like – and why it helps us today to learn about them. Using Hive, which can deliver to a bookshop near you, or by post. As an ePub from Hodder. A downloadable discussion guide, with four sessions. Four videos to accompany the study guide. You can visit my vimeo channel to view them or find out more here. Some extra bits, including blog posts, pictures, background articles, excerpts from the book, interesting links, some high-res colour versions of the maps in the book. And, um, one correction.